This New Internationalist photo gallery presents events from frontline struggles against climate change during the Paris climate talks. 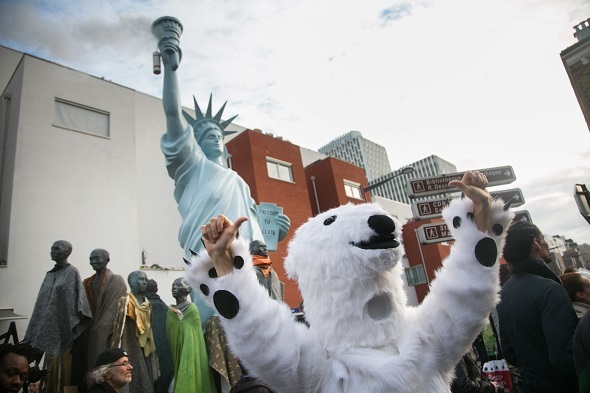 While climate negotiators from around the world wrangle in Paris over a final agreement, citizens, activists, and organizers have been pushing inside an outside the summit for real climate justice. In the aftermath of recent terrorist attacks public demonstrations have been banned during the two weeks of climate talks. However this New Internationalist photo gallery presents defiant public demonstrations and other events from frontline struggles against the harmful causes and effects of climate change. The gallery presents events till 11 December, the evening before the ‘D12’ event, the day when people and social movements plan to highlight their ‘redlines’ and escalate their struggle. All photos by Kristian Buus. Love oil performance. Citizen Climate Summit in Montreuil. 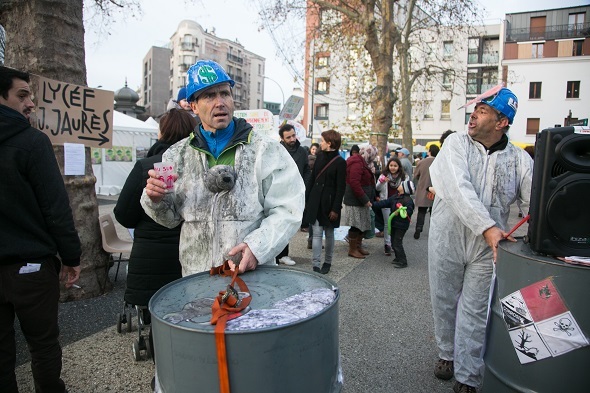 A host of organizations, small NGOs, political art events and food stalls set the scene for discussions and debates on climate change as an alternative to the official COP21 in Bourget. The official climate talks in Paris is on and the pressure to come up with a sustainable legally binding is high. In the aftermath of recent terrorist attacks public demonstrations have been banned during the two weeks of climate talks. Jenni Laity, a Sami women from Scandinavia, protesting in solidarity with other Indigenous people outside Total headquarters against tar sands and oil extraction. A protest by the peace wall near the Eiffel tower on International Human Rights day, 10 December. No climate justice without human rights. A 'World March of Women', at the peace wall near the Eiffel tower on International Human Rights day, 10 December. 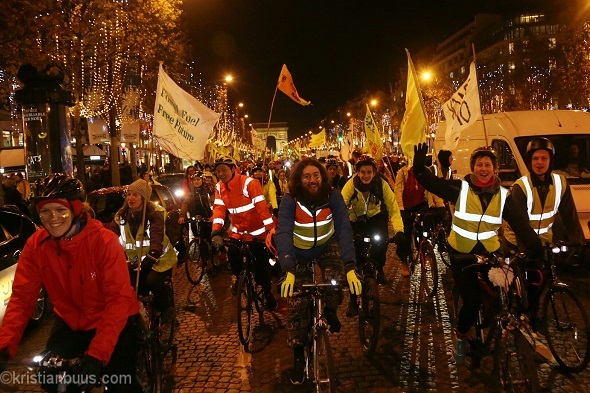 Bike riders for climate change, numbering about 150, arrive in Champs Elysee after five days on the road from London, to join the fight for climate justice in Paris, France. Hundreds gathered by the famous pyramid to spell out ‘FOSSIL FREE CULTURE’ with black umbrellas. The panel is cheered by a full house after the event. 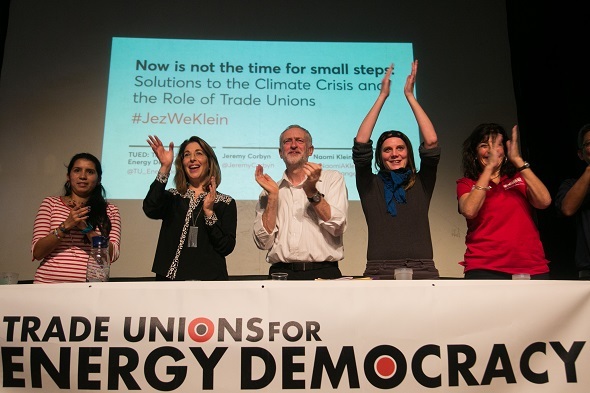 A panel of speakers, amongst others, British Labour party leader Jeremy Corbyn and author Naomi Klein speak at an event organized by The Trade Unions for energy Talks in Paris, coinciding with the COP21. 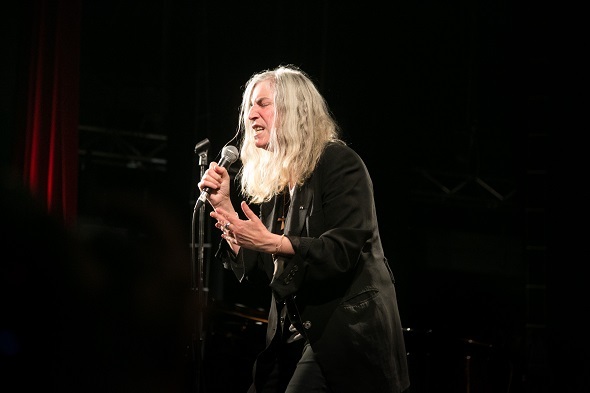 Patti Smith. Pathway to Paris set up by Jesse Paris Smith and Rebecca Foon. Live at Le Trianon, Paris coinciding with the climate summit, the COP21. 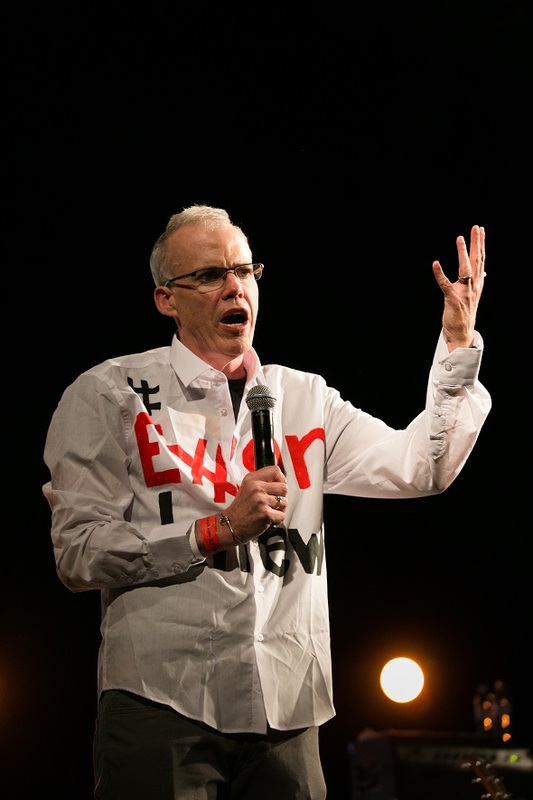 Bill McKibben founder of 350.org. Pathway to Paris set up by Jesse Paris Smith and Rebecca Foon. Live at Le Trianon, Paris coinciding with the climate summit, the COP21. Pathway to Paris set up by Jesse Paris Smith and Rebecca Foon. 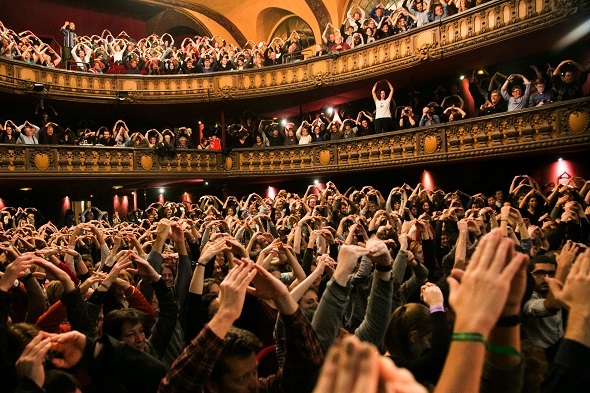 Live at Le Trianon, Paris coinciding with the climate summit, the COP21. A discussion and debate on food security at la Zac. A woman from a coastal community in Kenya speaks during the assembly. A representative from IEN – the Indigenous Environment Network speaks to the delegates. An alternative climate summit. 196 chairs were taken from banks who are believed to owe tax around Paris and used to host the event called 196 Chairs Summit. Citizen Climate Summit in Montreuil. 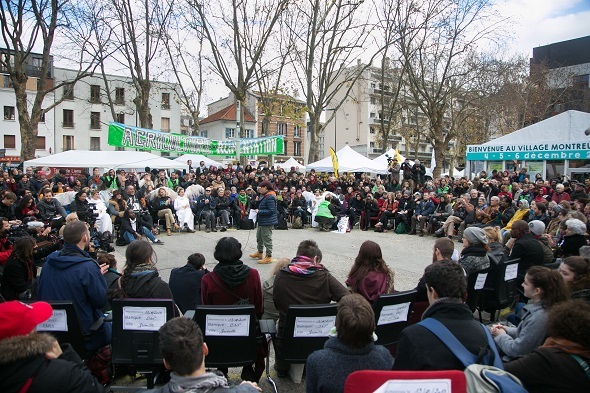 A host of organizations, small NGOs, political art events and food stalls set the scene for discussions and debates on climate change as an alternative to the official COP21 in Bourget. The official climate talks in Paris is on and the pressure to come up with a sustainable legally binding is high. In the aftermath of recent terrorist attacks public demonstrations have been banned during the two weeks of climate talks. Danish MP Christian Poll temping for artist Jens Galshiøt as a polar bear. Citizen Climate Summit in Montreuil. 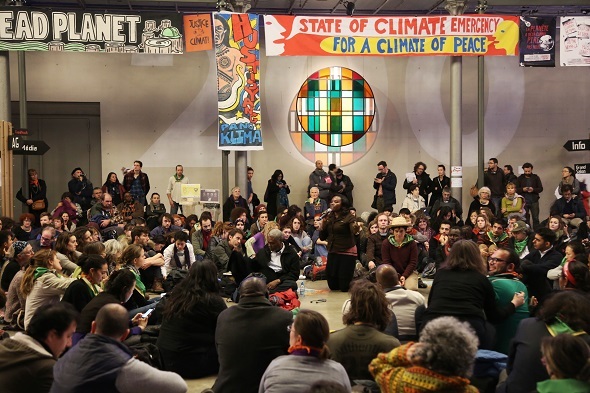 A host of organizations, small NGOs, political art events and food stalls set the scene for discussions and debates on climate change as an alternative to the official COP21 in Bourget. The official climate talks in Paris is on and the pressure to come up with a sustainable legally binding is high. In the aftermath of recent terrorist attacks public demonstrations have been banned during the two weeks of climate talks. Briefing on 11 December for the redline 'D12' action, on Saturday 12 December, which will involve 500 red umbrellas, 5,000 red flowers, and thousands of people on the streets of Paris. What if... we reduced carbon emissions to zero by 2025?